Transportation and mobility have been with humans since we came out of the trees and onto the grasslands, when we walked everywhere. Transportation has evolved to the present. The transformation of infrastructure and transportation is occurring as a result of two “sea level” changes: public-private partnerships in the general and narrow sense and the digital revolution. This manifests itself in the move to autonomous vehicles in a safe and seamless transportation system, “big data” to further enhance doing more at less cost (e.g. asset management, intelligent transportation systems and infrastructure, project delivery and all of the processes and enablers that allow delivery of products and services) and the collaboration of public-private partnerships in the broadest sense that leverage strengths of each. build the interstate, wait for the adjacent land prices to escalate, and sell it for a profit. None of the three were agreed upon and selected. The federal government finally adopted the funding mechanism that the states had been using for 30 plus years, the fuel tax. That was the advent of the Federal Highway Trust Fund to pay for construction (not maintenance) of the interstate highway system. Eisenhower signed this into law as the Federal Highway Act of 1956, commonly known as the National Interstate and Defense Highways Act – the largest public works project through that time. So what is the problem now and will we have to wait another 30 years to find a funding mechanism? It is common knowledge that the fuel tax continues as a valid funding mechanism, but it is no longer sustainable given more efficient vehicles, alternative fuels, recognition that oil is not a renewable resource, and concern over global warming. Several states have even increased their fuel tax in recent years under both Republican and Democratic administrations. This has been helped by the decreasing price of oil and the concomitant decrease in the price of fuel at the pump. So, what is the problem? We are victims of our own success, and to some extent spoiled, by fixed high speed highways. 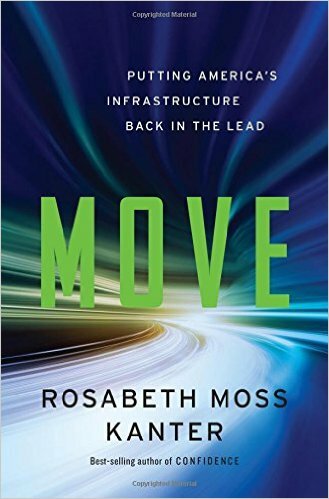 A new book, Move (putting America’s infrastructure back in the lead) by Rosabeth Moss Kanter provides an extremely well done analysis of where we are and where we are headed. She describes that mobility is the imperative, not infrastructure, vehicles or digital technology alone. We are at a “strategic inflection point” which requires that we change the way we think and act. We must develop a vision to bring the nation into the 21st Century and away from a 20th Century mindset. We must tell a complex story in a clear, simple and elegant way. We must change the perception from a tax-payer cost to a societal investment, produce jobs today and economic opportunity tomorrow, and move from a tax increase to a user fee. We must reinvent the passive highway with the information super highway and from fixed to dynamic infrastructure through collaboration across all interests; from a system that is static and unexciting to one that is dynamic and that people are willing to pay for. The only limitation is imagination. Kanter further states that we are stuck because connections across relevant players are lacking. We have obsolete ways of thinking and talking about it. In effect, we must be an open door to partnerships. In addition to GM and other more historically main stream transportation partners, some of these new partnerships include the digital world of IBM, Google, Verizon, Apple and others we do not normally associate with transportation and infrastructure. The world is changing and we must change with it. We must change how we think and find common, shared purpose in meeting the needs of all Americans. Kanter, Rosabeth Moss. Move: Putting America’s Infrastructure Back in the Lead. W. W. Norton & Company, 2015. Print.